A stem cell niche is a microenvironment responsible for the maintenance and growth of stem cells. Each stem cell niche is responsible for the production of distinct cells. There are two neural stem cell niches located in two distinct location in the brain. 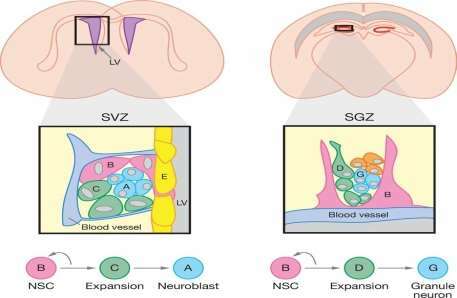 The SVZ of the lateral ventricle produces neuroblast, which differentiate to neurons and other neural cells, and the SGZ of the hippocampus produces stem cells which differentiate to granule neurons, which migrate to the olfactory bulb. EGFR is a transmembrane protein responsible for starting the proliferation of neural stem cells in the neural stem cell niche as well as control of centain proteins when exposed to its ligand, EGF. An experiment showed that EGFR is primarily located in highly proliferating cells. Another experiment showed the correlation between EGF to the rate of proliferation of neural stem cells. Both experiments concluded that stem cells cannot proliferate without EGFR. The neural stem cell niche is located in two locations, where each location produces distinct cells with different functions. These niches are located in the subgranular zone (SGZ) in the hippocampus and the subventricular zone (SVZ) in the lateral ventricle (Temple, 1989). As shown in figure 1, the SVZ is surrounded by a blood vessel (Li, & Xie. 2005).The endothelial cells of the blood vessel produce a location for the attachment of astrocytes (neural stem cells) and gives rise to numerous signals responsible for self-renewal of neural stem cells as well as lineage commitment (Shen, Q. 2004). The SVZ contains 4 primary cell types: neuroblast (A cell), SVZ astrocytes (B cell), immature precursor cells (C cell), and ependymal cells, as shown in figure 1 (left). C cells are the product of the asymmetrical division of astrocytes, which will differentiate to A cells (Li, & Xie. 2005). Ependymal cells separate the SVZ from the lateral ventricle, and is responsible for the production of cerebrospinal fluid (CSF) as well as circulation (Doestsch, 2003). Similar to endothelial cells of the SVZ, blood vessels that surround the SGZ provide an attachment site for astrocytes as well as signal transmissions into the niche (Doestsch, 2003). Astrocytes of the SGZ replicate to produce D cells, which are a differentiated form of C cells. When it is required, a signal transmission to the D cells triggers neurogenesis for the production of granule neurons. Which will migrate to the olfactory bulb (Doestsch, 2003). These D cells are able to undergo neurogenesis to granule neurons throughout the adult organism life, which is unique to very few number of neurons (Scadden, D.T. 2006). Figure 1. Morphology of the SVZ (left) and the SGZ (right) niche (Li. Xie, 2005). The left figure shows the niche components of the SVZ and its niche. As shown by the flow chart on the bottom of the figure, neural stem cell (B) differentiation gives rise to precursor cells (C), where further differentiation produces neuroblasts (A). The single layer of ependymal cells separating the niche from the left ventricle (LV) is represented by the letter E. The figure on the right represents morphology of the niche within the SGZ. Endothelial cells of the blood vessel triggers the differentiation of B cells to D cells, which will differentiate to granule neurons (G). The Epidermal growth Factor Receptor (EGFR) protein is a trans-membrane glycoprotein, responsible for the binding of proteins from the epidermal growth factor (EGF) family (Herbst, 2004). Binding of EGF to the receptor triggers nervous stem cell proliferation, as well as cell growth and differentiation (Harris. et al, 2003). More specifically, binding of EGF causes stimulation of the intrinsic protein-tyrosine kinase activity of the receptor, which results in the auto-phosphorylation of bonded receptor, allowing for the binding of the Grb2 adaptor protein. Binding of the Grb2 adaptor protein allows for the binding and activation of the Ras-GEF protein, SOS. SOS activates Ras by phosphorylating GDP to GTP. Phosphorylation of GTP allows for the activation of the Raf protein. Raf protein will bind to and phosphorylate the MAP kinase, which dimerizes, allowing passage into the nucleus of the neural cell, which stimulates transcription factors. These factors allow for an increase in intracellular Calcium ions (Ca2+), increased rate of glycolysis, protein synthesis, as well as activation of certain genes. This includes the expression for the gene responsible for the activation of EGFR, which leads to DNA synthesis, which gives a rise to cell proliferation (Herbst, 2004). EGFR is the most upstream part of the transduction pathway in the cell, which initiates the signal cascade inside the cell (Herbst, 2004). It has been shown that EGFR is responsible for the expression of the notch protein. Notch is a transmembrane protein responsible for the control of the identity of neural stem cells as well as self-renewal in the SVZ (Aguirre. et al, 2010). Silencing of the notch gene allows for the asymmetrical differentiation of neural stem cells to precursor cells (Aguirre. et al, 2010). On the other hand, the over-expression of EGFR in neural stem cells will down-regulate notch signaling, which causes the up-regulation of genes involved in neurogenesis (Aguirre. et al, 2010). Doetsch et al (2002) hypothesized: if cells show a high amount of EGFR, then there would be a high rate of proliferation of neural cells. The study was conducted by obtaining an immunostaining a section of adult mouse lateral ventricles in order to determine which part of the SVZ had EGFR. The study showed that only neural stem cells directly in contact with the lateral ventricle showed expression of EGFR. Neuroblasts also showed no trace of EGFR in the staining. EGFR is not present in neuroblasts because these cells do not proliferate any further, but rather differentiate to neural cells (Doestsch. et al, 2002). It was concluded that EGFR is present primarily in Type C cell because these cells are the most proliferating cells in the SVZ niche. Therefore, proliferating cells will have the most EGFR (Doestsch. et al, 2002). In another study done by Doetsch et al. (2003), SVZ cell response to the stimulation of EGF was investigated by infusing EGF to the lateral ventricle of an adult mouse for 7 hours. The hypothesis was: if C cells had the most EGFR, then infusion of EGF would induce proliferation. Analysis was done using an electronic microscope. After 7 hours of EGF infusion, C cells proliferated twice as much, compared to the control saline infusion. On the other hand, the number of neuroblasts were halved, while the number of the neural stem cells remained similar to that of the control mice. It is important to note that while the astrocytes of the EGF infused mice remained constant to the control mice, they were shifted towards the lateral ventricle. This was very interesting as not only did it show that EGF increased the cell proliferation, it also showed that C cells shifted towards self-renewing, causing the inhibition of neuroblast formation. This also supports the statement mentioned earlier about the over expression of EGFR, which will inhibit the notch protein (Aguirre. et al, 2010). A stem cell niche is a microenvironment, responsible for the production and maintenance of stem cells, until they differentiate to specialized cells and are transported to its destined location. There are two distinct niches located in the SVZ in the lateral ventricle and the SGZ in the hippocampus. EGFR is vital for cell proliferation, as shown by two different studies done by Doestch et al. Aguirre, A., Rubio, M. E., & Gallo, V. (2010). Notch and EGFR pathway interaction regulates neural stem cell number and self-renewal. Nature , 323-327. Doetsch, F. (2003). A Niche for Adult Neural Stem Cells. Current Opinion in Genetics & Development , 543-550. Doetsch, Petreanu, Caille, Garcia-Verdugo, Alvarez-Buylla, & Arturo, a. (2002). EGF Converts Transit-Amplifying Neurogenic Pecursors in the Adult Brain into Multipotent Stem Cells. Neuron , 1021-1034. Harris, R. C., Chung, E., & Coffey, a. R. (2003). EGF Receptor Ligands. Experimental Cell Research , 2-13. Herbst, R. (2004). Review of Epidermal Growth Factor Receptor Biology. Journal of Radiation, Oncology, Biology, Physics , 21-26. Li, L., & Xie, T. (2005). Stem Cell Niche: Structure and Function. Annual Review of Cell and Developmental Biology , 605-631. Scadden, D. T. (2006). The Stem-cell Niche as an Entity of Action. Nature , 1075-1079. Shen, Q. (2004). Endothelial Cells Stimulate Self-Renewal and Expand Neurogenesis of Neural Stem Cells. Science , 1338-1340. Temple, S. (1989). Division and Differentiation of Isolated CNS Blast Cells in Microculture. Nature , 471-473. "Neural Stem Cell Niche and EGFR Protein." UKEssays.com. 11 2018. All Answers Ltd. 04 2019 <https://www.ukessays.com/essays/biology/neural-stem-cell-niche-egfr-protein-7532.php?vref=1>. "Neural Stem Cell Niche and EGFR Protein." All Answers Ltd. ukessays.com, November 2018. Web. 23 April 2019. <https://www.ukessays.com/essays/biology/neural-stem-cell-niche-egfr-protein-7532.php?vref=1>. UKEssays. November 2018. Neural Stem Cell Niche and EGFR Protein. [online]. Available from: https://www.ukessays.com/essays/biology/neural-stem-cell-niche-egfr-protein-7532.php?vref=1 [Accessed 23 April 2019]. UKEssays. Neural Stem Cell Niche and EGFR Protein [Internet]. November 2018. [Accessed 23 April 2019]; Available from: https://www.ukessays.com/essays/biology/neural-stem-cell-niche-egfr-protein-7532.php?vref=1.